There is an Admission Committee, which interviews the candidates seeking admission and lays terms and conditions for the same. 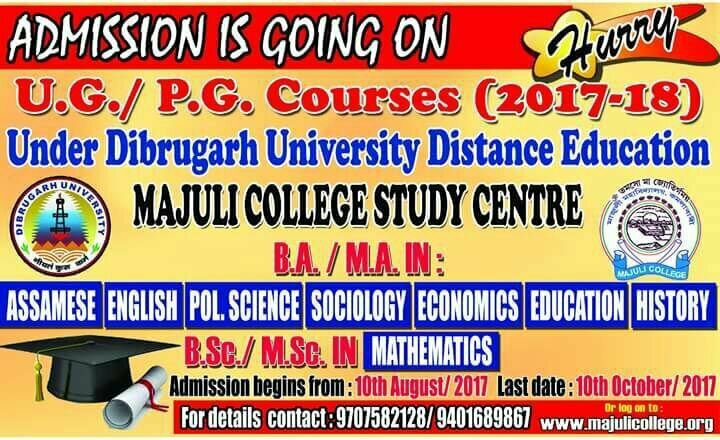 40 (Forty) percent at Higher Secondary Examination is the cut off marks for admission into degree major courses, but, for other courses there is no such bar. 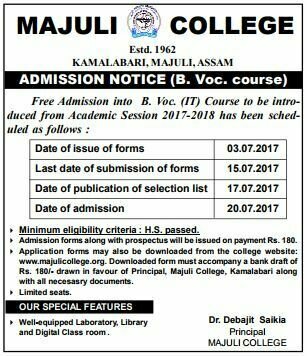 A candidate having passed his/ her previous examination can apply for Higher Secondary/ Degree Course. There is no age limit as such. Admission form along with the prospectus is obtainable from the concerned counter on a payment of Rs. 120/-. It should be duly filled in with the help of the Prospectus and submitted to the office on or before the last date for submission. 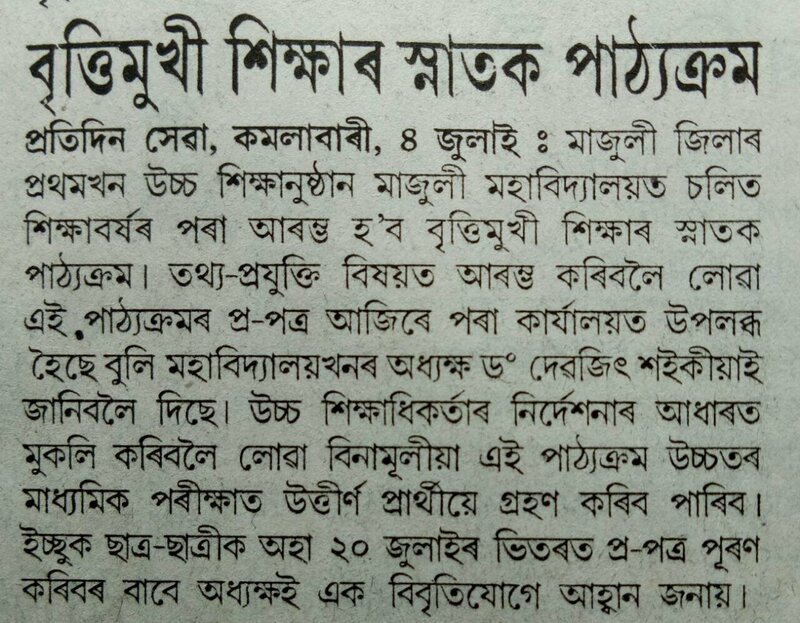 Students from Boards or Universities other than SEBA, AHSEC or Dibrugarh University shall have to produce Migration Certificate at the time of admission. All admissions are provisional and subject to the approval of D.U. / AHSEC. The admission procedure for all Under Graduate Courses normally starts in the month of June every year. 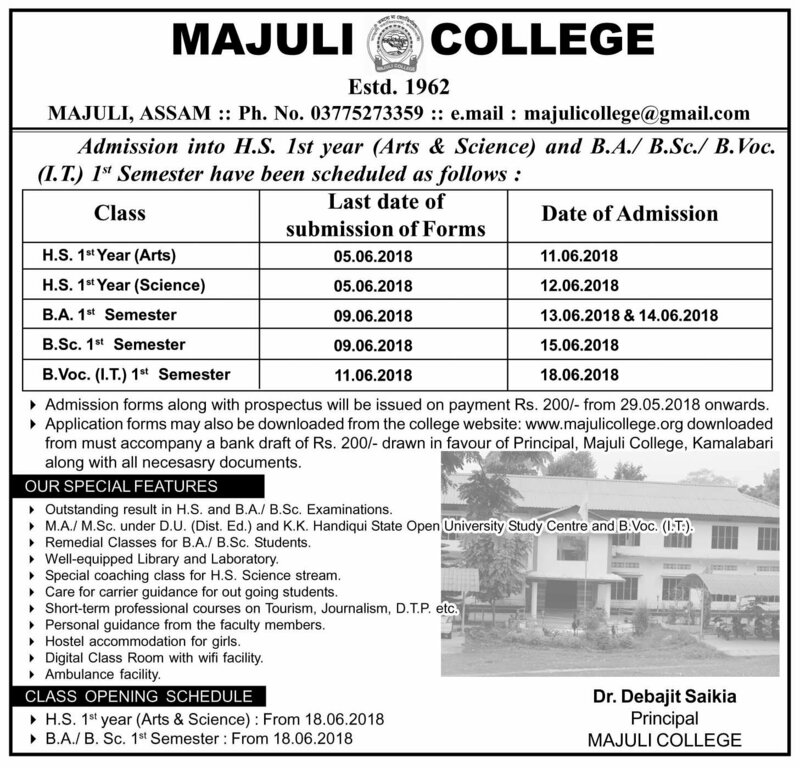 The admission schedule is displayed through College Notice-Board & Website. Duly filled in application forms along with photo-copies of admit cards, all marks sheets and pass certificate and caste certificate must be submitted within the stipulated time(s). 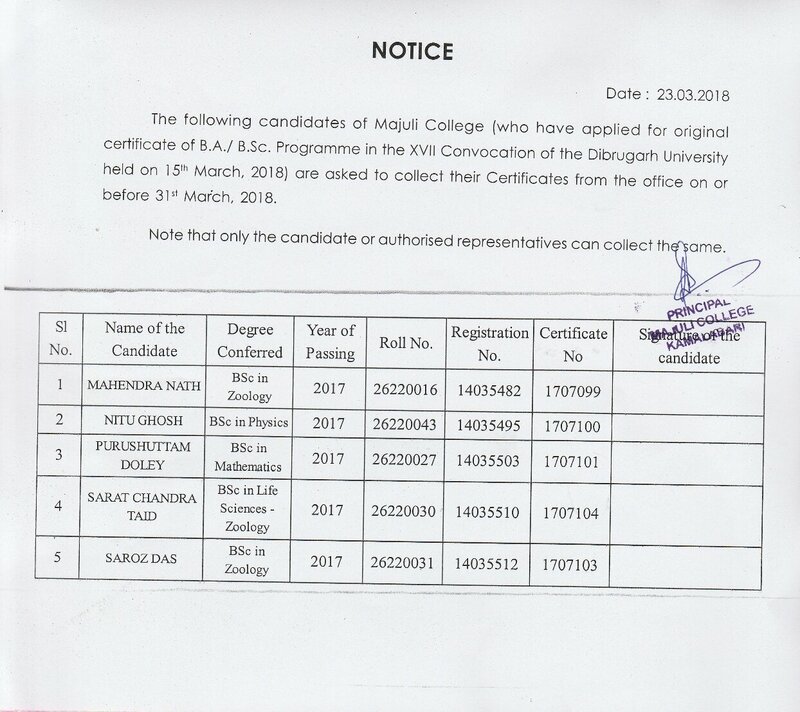 The lists of selected candidates are displayed on the College Notice-Board. Selected candidates have to appear personally before an interview board and to produce all testimonials in original at the time of interview. Change of stream or subject after the admission is not allowed. 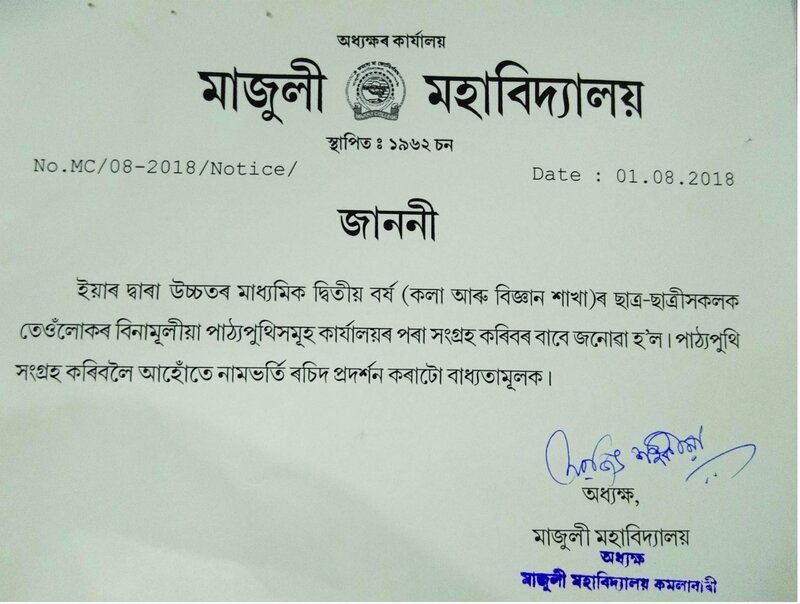 As per Dibrugarh University regulations the candidates having a gap of more than 3(three) years after passing the Higher Secondary course shall not be permitted to take admission in the B.A/B.Sc. 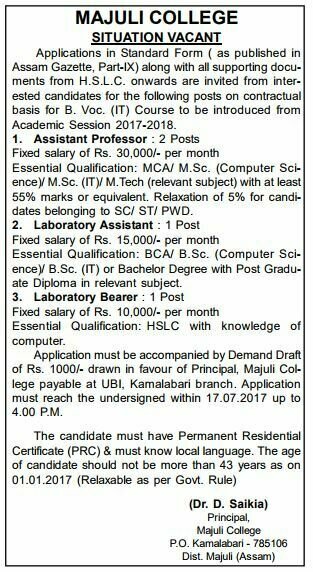 courses provided that a candidate pursuing some other courses of study shall be relaxed from the above mentioned conditions. Entrance tests for admission into Major courses in certain departments will be conducted by the concerned departments before admission. Selection will be made on the basis of the marks obtained in HS + marks obtained in the entrance test. Dates of the test will be notified in due course of time. The final decision to hold the test or do otherwise shall remain vested with concerned departments. 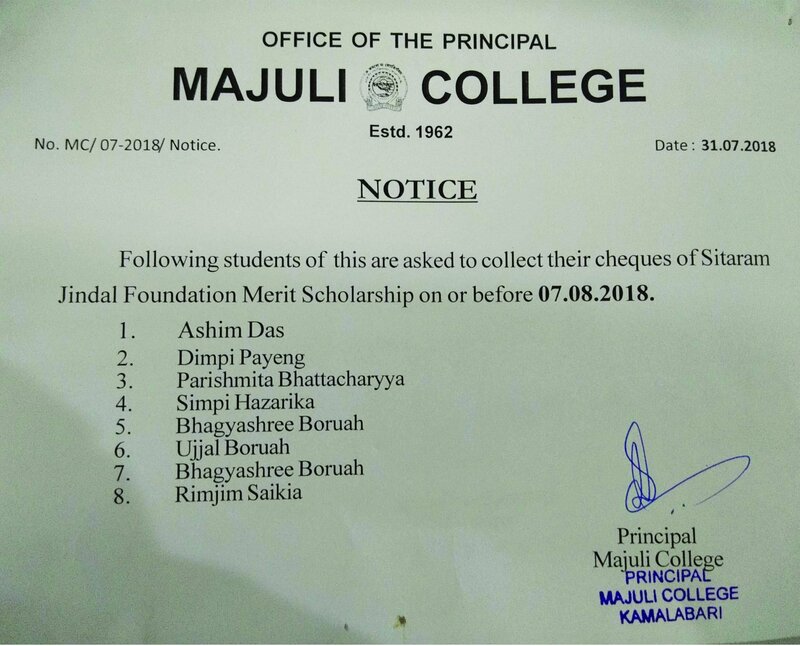 In the other subjects, admission to the Major Courses will be on the basis of marks obtained in the concerned subject in the Higher Secondary Final Examination. Seats will be reserved for candidates belonging to SC, ST (Plains) and ST (Hills), OBC, MOBC and Differently-abled categories as per Govt. rules. 5% of the total seats are also reserved for the students having proficiency in sports, NCC, NSS, Scout and cultural activities. Applications from students having single parent alive and land donors will also be considered. Candidates applying for caste reservation must produce Caste Certificate countersigned by the SDO (Civil) or DC. Candidates applying for other categories must produce appropriate certificate. For sport category certificates of outstanding performance at inter-district or higher level only will be considered.